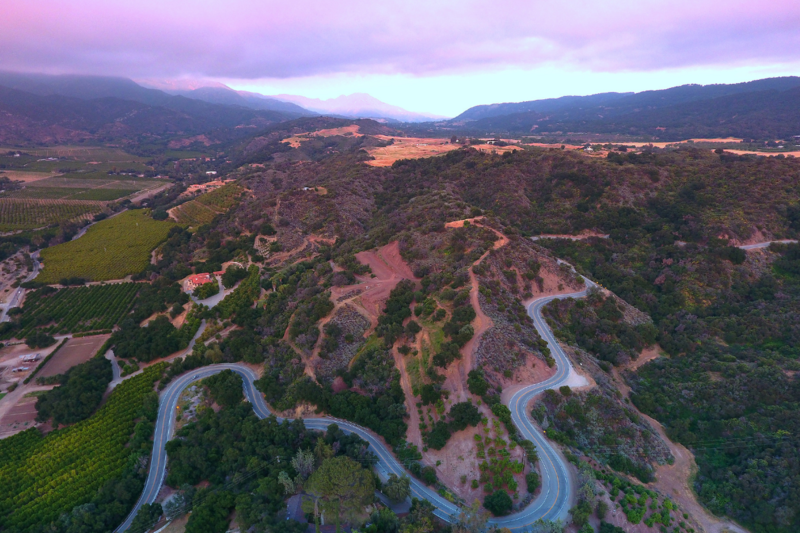 Stunning pink moments, enchanting trails, relaxing spas, fabulous golf and gallery hopping – this and more awaits you when you open yourself to an Ojai adventure. Enjoy some relaxing spa time, grab a bite to eat, get outdoors or spend an afternoon wine tasting, or find a great book between concerts. Ojai also has several unique and exciting events throughout the year. Look below for a more details on your Ojai experience. Located 15 miles inland from Ventura, California and 65 miles north of Los Angeles, the bucolic Ojai Valley is surrounded by scenic hills and intoxicating orchards, brimming with small town charm and creativity. From Los Angeles and points south: Take 405 Freeway north, to 101 west to Ventura. Exit 101 at Highway 33. Follow 33 into Ojai Valley; merge onto Ojai Avenue. Proceed into town. From Santa Barbara and points north: Take 101 Freeway south to Ventura. Exit 101 at Highway 33. Follow 33 into Ojai Valley; merge onto Ojai Avenue. Proceed into town. From Santa Clarita and Interstate 5: From Interstate 5, take Highway 126 west to Ventura. Merge onto 101 north in Ventura. Exit 101 at 33. Follow 33 into Ojai Valley; merge onto Ojai Avenue. Proceed into town. Rental car agencies are available at all three airports. Amtrak service is available to the Ventura station. View the Amtrak website for schedules and fares. Once you arrive in Ventura, you can take the Gold Coast Transit bus (Route 16) to downtown Ojai, or arrange for a taxi to take you to your final destination. Free parking is available on the streets surrounding Libbey Park and in various lots within a two-block radius. There are public lots on Montgomery St. and on Matilija St. (view map). We highly recommend allowing enough time to find parking and have a leisurely stroll in downtown Ojai or enjoy Libbey Park. Downtown Ojai is extremely walkable, with stores, restaurants and more within a two block radius of Libbey Bowl. The paved Ojai Bike Path runs throughout the city and bikes can be rented from The Mob Shop, located in downtown Ojai. The Ojai Trolley Service can also take you around town and has service to the Ojai Community Church. Visit the Ojai Trolley Website for routes and service information. Topa Topa Taxi provides taxi service to destinations throughout the valley. Known for using fresh and local ingredients, Ojai’s many restaurants offer visitors a unique taste of the central coast. No trip to Ojai is complete without a delicious meal – use our quick restaurant guide to help you plan your culinary adventure! Mexican food with a fresh twist, featuring several organic and healthy options. Restaurant has a large outdoor patio and a wide selection of drinks. Located downtown. Reservations are recommended. Breakfast: Saturday & Sunday 8:30-3 p.m.
Tasting Room: Friday – Sunday 12-5 p.m.
Reservations are highly recommended for Friday and Saturday Nights. Homestyle breakfast and lunch diner. Features a wide range of traditional American entrees – a local favorite for breakfast. Make sure to arrive early to get a table. Located in beautiful downtown Ojai, Jim and Rob’s Fresh Grill offers comfortable indoor dining and scenic patio dining, and fresh made salsa at our salsa bar. Jim and Rob’s Fresh Grill offers a wide variety of Mexican American choices and regional favorites. A menu offering organic, gluten-free, vegatarian, and paleo offerings. Longtime Ojai favorite Ojai Cafe Emporium serves up soups, sandwiches, quiches alongside their famous baked goods. Bakery faces Montgomery St., restaurant is just behind. Reservations recommended. The Ojai Valley Inn offers a wide variety of phenomenal dining experiences. Explore their website for further details. Authentic Italian cuisine offered at the heart of downtown Ojai. A wide range of pastas, entrees, and pizzas made fresh from local ingredients. Reservations are strongly recommended. Rainbow Bridge’s hot deli offers a wide variety of dishes as part of their rotating menu, as well as sandwiches, soups, and smoothies. The grocery has all the ingredients to perfect your picnic. Owned by Adam and Helen Tolmach, the Ojai Vineyard produces artisan wines using local Ojai and Central Coast grapes. Located a block from Libbey Bowl, their cozy tasting room is a great place to unwind between concerts. These are some experiences we highly recommend you take advantage of when you visit Ojai. We promise that each of these places and activities will enrich the time you spend here!